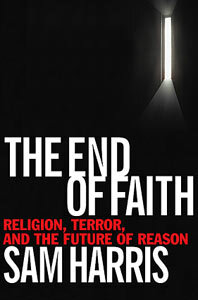 Alan Dershowitz, professor of law at Harvard says the book “The End of Faith” by Sam Harris is a “Must read for all rational people”. “We have names for people who have many beliefs for which there is no rational justification. When their beliefs are extremely common, we call them “religious”; otherwise, they are likely to be called “mad”, “psychotic” or “delusional.” To cite but one example: “Jesus Christ — who, as it turns out, was born of a virgin, cheated death and rose bodily into the heavens — can now be eaten in the form of a cracker. A few Latin words spoken over your favorite Burgundy, and you can drink his blood as well. Is there any doubt that a lone subscriber to these beliefs would be considered mad?” The danger of religious faith, he continues, “is that it allows otherwise normal human beings to reap the fruits of madness and consider them holy”. Right now, if you are even vaguely observant, or have friends or grandmothers who are, you may be feeling not merely irritated, as you would while reading a political columnist with whom you disagree, but deeply offended. You may also think it inappropriate that a mainstream newspaper be seen as obliquely condoning an attack on religious belief. That reaction, in Harris’s view, is part of the problem. “Criticizing a person’s faith is currently taboo in every corner of our culture. On this subject, liberals and conservatives have reached a rare consensus: religious beliefs are simply beyond the scope of rational discourse. Criticizing a person’s ideas about God and the afterlife is thought to be impolitic in a way that criticizing his ideas about physics or history is not.” A zippered-lip policy would be fine, a pleasant display of the neighborly tolerance that we consider part of an advanced democracy, Harris says, if not for the mortal perils inherent in strong religious faith. The terrorists who flew jet planes into the World Trade Center believed in the holiness of their cause. The Christian apocalypticists who are willing to risk a nuclear conflagration in the Middle East for the sake of expediting the second coming of Christ believe in the holiness of their cause. In Harris’s view, such fundamentalists are not misinterpreting their religious texts or ideals. They are not defaming or distorting their faith. To the contrary, they are taking their religion seriously, attending to the holy texts on which their faith is built. Unhappily for international comity, the Good Books that undergird the world’s major religions are extraordinary anthologies of violence and vengeance, celestial decrees that infidels must die. In the 21st century, Harris says, when swords have been beaten into megaton bombs, the persistence of ancient, blood-washed theisms that emphasize their singular righteousness and their superiority over competing faiths poses a genuine threat to the future of humanity, if not the biosphere: “We can no longer ignore the fact that billions of our neighbors believe in the metaphysics of martyrdom, or in the literal truth of the book of Revelation”, he writes, “because our neighbors are now armed with chemical, biological and nuclear weapons”. Harris reserves particular ire for religious moderates, those who “have taken the apparent high road of pluralism, asserting the equal validity of all faiths” and who “imagine that the path to peace will be paved once each of us has learned to respect the unjustified beliefs of others”. Religious moderates, he argues, are the ones who thwart all efforts to criticize religious literalism. By preaching tolerance, they become intolerant of any rational discussion of religion and “betray faith and reason equally”. Harris, no pure materialist, acknowledges the human need for a mystical dimension to life, and he conveys something of a Buddhist slant on the nature of consciousness and reality. But he believes that mysticism, like other forms of knowledge, can be approached rationally and explored with the tools of modern neuroscience, without recourse to superstition and credulity. See an Interview with Sam Harris.